As companies and intellectual property are bought and sold across borders, technical accuracy is of paramount importance and can be extremely complicated when the two companies involved in such exchanges operate in different languages. Such was the case for one of MedL10N’s clients, a large automobile manufacturer. After purchasing intellectual property of another automaker, they needed to put the technology to immediate use in producing their next line of vehicles. 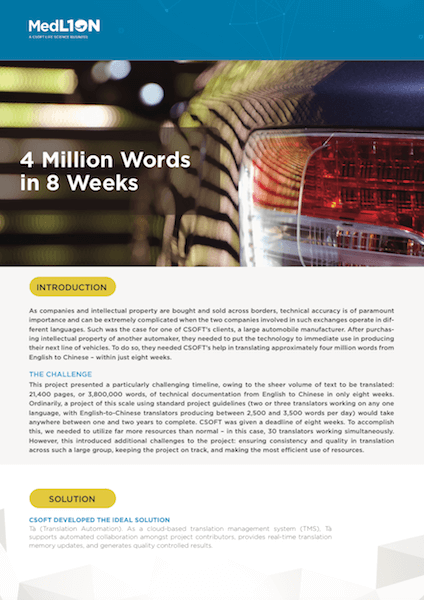 To do so, they needed our help in translating approximately four million words from English to Chinese – within just eight weeks.